The CAS challenge this week on SCS140 is a theme - Cupcakes! 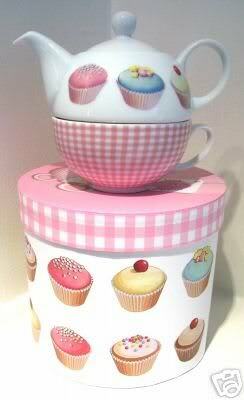 It just so happens that the Teapot Tuesday challenge MMTPT168 this week is also - Cupcakes! so I waited to combine them both to send to Elsie in Aurora, Colorado. Elsie's birthday is Oct. 31. She's the mom of the co-pilot of the helicopter that was shot down with all the Navy Seals aboard a few weeks ago. We're hoping to try to bring her some birthday cheer so no Halloween or sad cards...just cupcakes...lots and lots of cupcakes! I'm running on 2 hours of sleep so keeping this short and simple because very soon I will cease to make any sense at all. Here's the inspiration teapot Cindy chose. I decided to go with the pattern and pretty colors. Look what I caught...after I took the photo! That pearl is definitely not supposed to be there...guess it's tired too. Oh how positively adorable!!! Love your sweet pink take on the challenges ... darling card. Now I'll definitely need to check out one or both of those challenges this week! How adorable, how simply adorable. love the cupcakes and the table cover is so delicate and pretty. Lovable card, honestly. These cupcakes are simply adorable... I love it...I love how you added the glitter and the pearls... Great card..
LOVE thos cupcakes! so much detail!! Awww, what a sweet card...I'm lovin all the sparkly little cupcakes!!! Fun take of this challenge Charlene! "dose pearls be pretty!"